Located off Hwy 29 N in the Hollymead Community, Silver Thatch Inn is a quick 10 minute drive from Charlottesville Regional Airport, 6 miles from Downtown Charlottesville & a comfortable 15-40 minute drive to Monticello, Ashlawn Highland, Montpelier, award winning wineries & artisan breweries, and some of Virginia's best restaurants. Once a Colonial farmhouse & Hessian barracks, all seven of our well appointed guest rooms offer complimentary Wi-Fi & off street parking, a full breakfast each morning with our housemade sausage, hash, & breads, flat screen TVs with cable, charging stations, Telegraph Hill robes & Greenwich Bay bath products. Several rooms offer wood burning fireplaces. A glass of house wine or a local brew with our compliments welcomes you to the Inn. Wine and beer are available in our English Pub. Silver Thatch is the perfect venue for special occasions, half day or day business team building/brainstorming sessions. 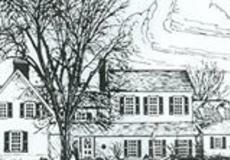 Book the entire Inn for a weekend for reunions or gatherings. We are smoke free and primarily adult oriented, guests 14 and over are welcome. We love pets and have our own, but pets aren't allowed in the Inn.